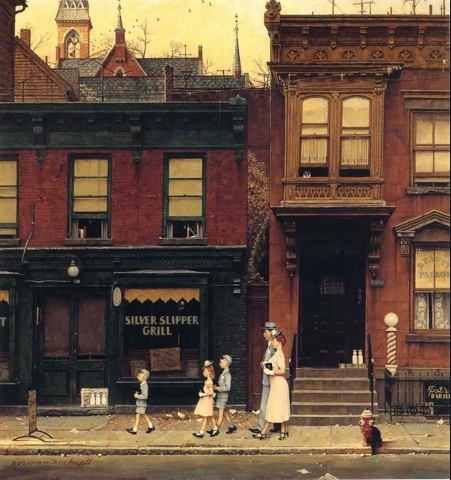 I wasn’t aware of this piece by Norman Rockwell before it sold the other day for $3.2 million. That’s a sum glamorous enough to catch one’s attention. What jumped out at me are the threatening, if absurd, faces in the two principal buildings. Their oddness doesn’t seem like the sort of thing Rockwell does, but I have too much respect for him to suppose that there are any accidents in his paintings. The effect of the faces is to impart to the geeky family a certain moral grandeur. Here they are, determined worshippers braving the racy “Silver Slipper Grill” with its malevolent stare and bared teeth and tongue. They are also so grotesque that it would seem unkind to notice them, except that there are many such people in Rockwell’s work, and he views them all with the same cool, anthropological eye. Yes, this is what we are like, but awareness doesn’t rule out sympathy.